Part Number: MH3E2LL/A. Network: CDMA, GSM/EDGE, UMTS and LTE (factory unlocked) Drive Capacity: 16GB. This sale is for a new iPad mini tablet. We are looking to offer you the best possible price on all of our items! Apple iPad mini with Retina Display 16 GB, Factory unlocked. ( Unlocked) for any GSM NETWORK WORLDWIDE 7.9in Silver/White. This is new sealed in the box. For GSM service providers only. Wi-Fi, 7.9in, Gold. This is new sealed in the box. We cannot send an item as a "Gift", item will be sent as an " ebay purchase"
Brand new gold 16gb iPad mini. Geniune Apple iPad Mini Retina (2nd Gen) 16GB WiFi 4G Grey *NEW! * + Warranty!!! Apple iPad Mini with Retina Display. * All Brand new iPads come with a 12 Months replacement/repair warranty from Apple if it becomes faulty. Warranty starts from the date of delivery. 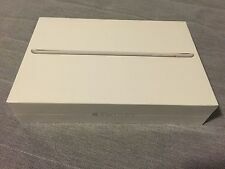 Geniune Apple iPad Mini Retina (2nd Gen) 16GB WiFi 4G White *NEW! * + Warranty!!! Apple iPad mini 4 16GB, Wi-Fi + Cellular, Silver in great condition! Apple iPad Mini 3 Retina Display 16GB Wi-FiSILVER. Check out More iPads and iPhones ! A fully working iPad. Mint screen, back has some minor scuffs from general use. Apple iPad Mini 4 16GB, Wi-Fi, 7.9in, Gold, BRAND NEW, SEALED BOX, PRISTINE!! !